Maureen’s Haven began in 2002 as a grassroots program under the auspices of Peconic Community Council (PCC). Through PCC, the Peconic Housing Initiative was established, funded by board member emeritus, Kay Kidde. In response to witnessing homeless men and women sleeping in the woods and at the local train station, the Maureen’s Haven Program was created. The program is modeled after Fr. 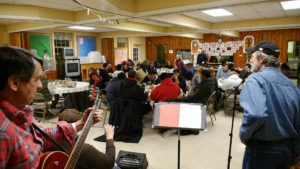 Charles Strobel’s “Room in the Inn” program in Nashville, Tennessee. Maureen’s Haven is named after Sister Maureen Michael, a Dominican Sister, who tried to set up a similar program decades ago but could find no congregations willing to participate. Today, this program brings a variety of organizations and houses of worship together to help meet the needs of homeless men and women during the cold winter months. The goal of Maureen’s Haven is to provide safe, warm temporary shelter to homeless individuals from November through March, utilizing volunteer houses of worship and congregation volunteers. The host facilities and supporting organizations provide much more than a place to sleep and a nutritious meal. They provide support through embracing the values of human dignity, respect, service, compassion, teamwork, diversity and love. Recognizing the need for consistent support and services for the homeless and near homeless in the region, Maureen’s Haven opened a day center in Riverhead, the hub of the twin forks, to provide respite from the cold and year-round services for this vulnerable and growing population. The day center is the first of its kind in Suffolk County. A variety of programs are offered throughout the year. In addition to meeting their immediate needs, Maureen’s Haven strives to place individuals in supportive housing which provides consistent shelter and case management. Over the past three years, we have placed over 30 individuals in housing, provided counseling and assistance with job search and placement, and offered a continuum of care that has helped individuals in re-building their lives.